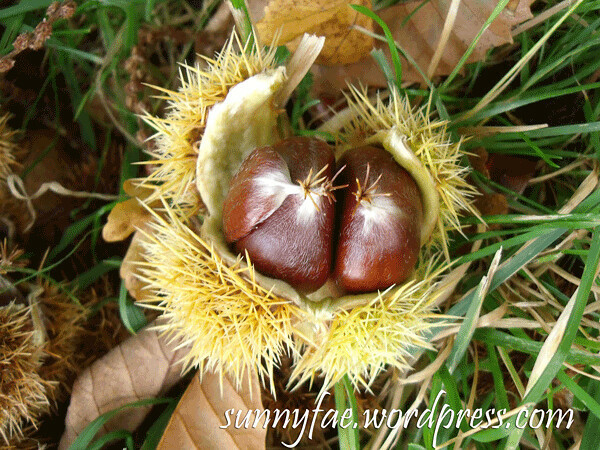 On a sunny autumn walk this week we stumbled across two chestnut trees. We started to pick them. They are very spiky, quite often they fall off the trees semi open and you just have to pick the fat nuts (the skinny ones are usually empty) out of the shells . Before we knew it we both had quite the stash of nuts and brought them home. Now what to do with them? I don’t usually bother with chestnuts, they’re fiddly and explosive. By that I mean I’ve tried to roast them before and sent them ricocheting around the oven. This time I looked up on the internet how to cook them. For roasting cut a slit or cross in the bottom (a small pin hole is not enough) and roast for 10-25 mins. I cooked mine roughly 15 minutes and they were just nice. 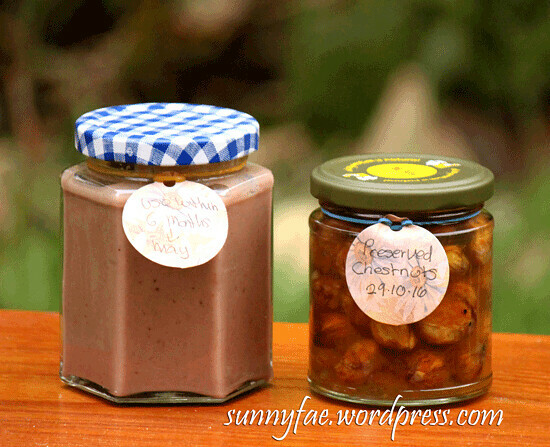 chestnut jam and preserved chestnuts. Apparently chestnuts have a low fat content and don’t keep, so I decided to have a go at preserving them. The first jar is chestnut jam recipe from the River Cottage book by Pam Corbin. This book has lots of unusual recipes for all kinds of preserves and is one of my go to books at this time of year. It’s as much of a spread as it is a jam, it goes really nicely with chocolate (yes we tested that theory) it will be lovely in a chocolate cake I’m sure. 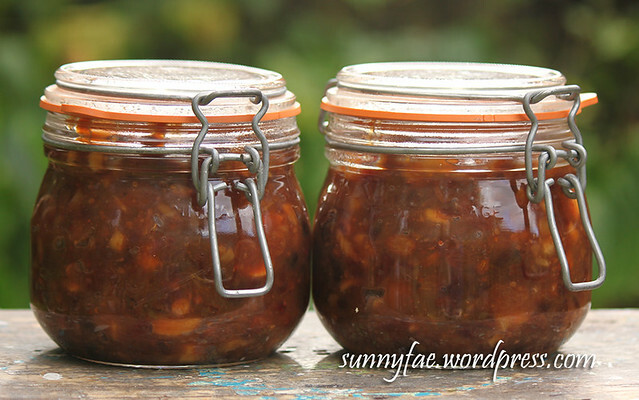 The second jar is whole chestnuts preserved in syrup, (recipe here). The syrup recipe on its own is lovely and is something I will use again, and not just for chestnuts. We have to leave the chestnuts for at least a week before eating them, that’s disappointing, can’t wait to taste them. Since this is a cooking post I’ve kept it on its own, it’s too confusing to put with all the drawing/crafting ones, plus it makes it easier to find next year when I forget what I did! 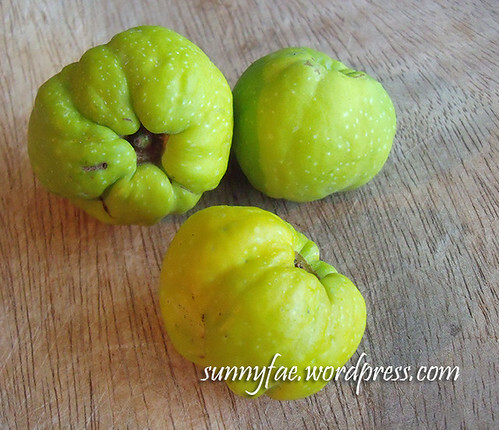 The last of mums quince (japonica) ripened, and I got the privilege of cooking them up for every one. You can get a rough idea of the size by comparing them to the rose hips in the picture. They are quite a bit bigger than the quince I cooked here. I had also been given a carrier bag full of pears. They’re eating pears and taste really good but for some reason this year they stayed hard no matter how long they were left to ripen. So what to do with all these goodies. 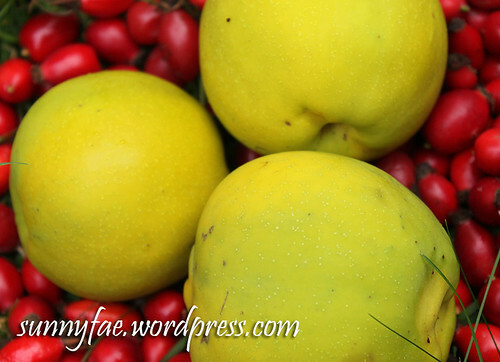 We really like the quince with rosehip. It seems to be the flavour of the year. This meant more hip picking and as luck would have it we found a little patch unpicked. 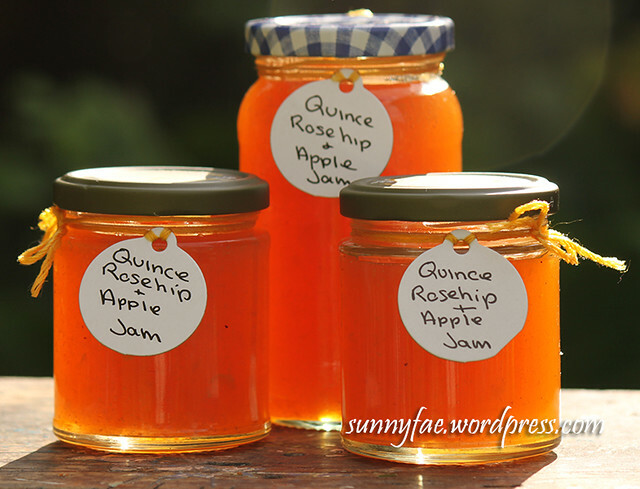 I made a few more jars of rosehip quince and apple which will satisfy that family craving. 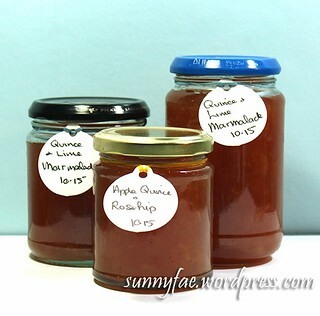 Next I had a small bag of limes in the house so I made quince and lime marmalade. Later in the week we tested a few with a little yoghurt, it worked well, the pears cooked and softened a little and they tasted great. 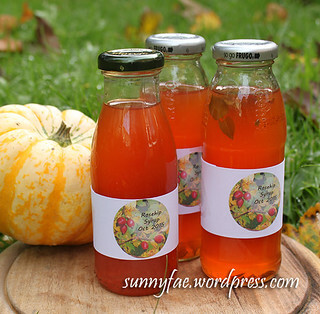 Finally with the last of the rosehip juice I made up two batches of rosehip syrup. One slightly minted with peppermint leaves and one with blackcurrant leaves. I noticed a lot of fruity herbal teas add blackcurrant leaves to their ingredients so I experimented with some from the garden. It doesn’t taste like blackcurrants but it does add something extra to the flavour. 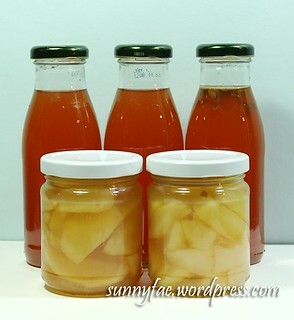 I left some of the leaves in the bottles to see if they infuse a little more. It’s all a bit experimental but I won’t know unless I try it. Well that’s the preserving marathon over for another year. Autumn is moving on and now its getting time to snuggle down and enjoy the fruits of our labours. Last week I made jams, and jellies. 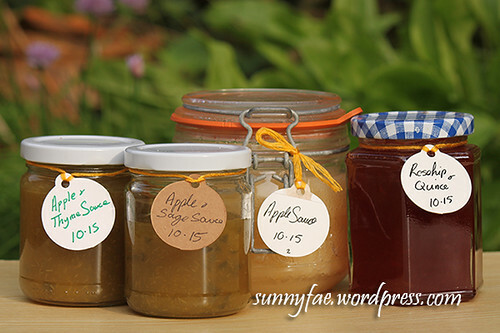 This week I’m bottling some apple sauce. There is no sugar or preserving agent to stop bacteria forming so the point of bottling them is to kill off any bacteria and sterilize the fruit inside. This will hopefully prevent them to spoiling for a longer time. I haven’t tried this before so it all feels a bit experimental. It was a lot easier than I thought. I had most of the tools already but the one thing I will be buying next time I do this is jar tongs. The jars are really hot when you take them out of the water. I used a thick pair of rubber gloves and just managed but the right tools for the right job me thinks. Save any future accidents from happening. Between them they have plenty of information and recipes to keep me going for a good long time. On this particular day it was Pam Corbin’s book I used and inside is a recipe for herb flavoured jellies. I didn’t make jelly because although the fruit wouldn’t be wasted (it would be used in something else) I didn’t feel like waiting for the fruit to strain. I decided I would cook the apple skins (just the good ones) and blend them up just to see what happens. It turned into a thickish apple sauce so I used this along with some actual apple, added the herbs and followed the recipe from where the fruit pulp is measured. 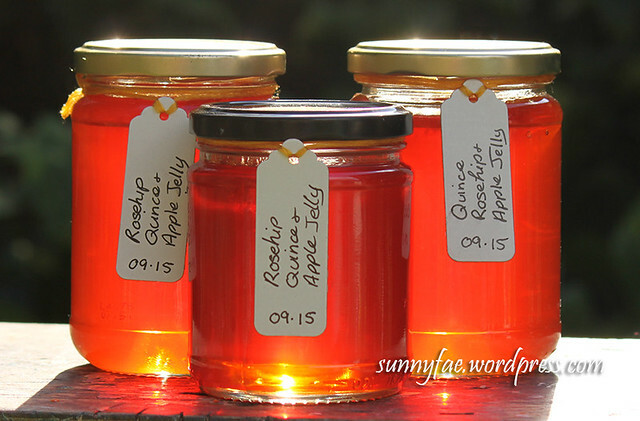 I haven’t tried these out on the family yet so only made a small batch (two small jars) just to see how they go. There will probably be more things to make but for now that’s enough. I now have to find somewhere to put all of these jars! Recently a call went out on the freegle website “the apples are ready and I have too many, please come, pick some and take them home” or words to that effect. Freegle is a website that people post up things they no longer need. This is their blurb “Our aim is to save useable stuff from going into landfill and develop positive and local community spirit along the way.” I’m all for saving stuff from landfill and really don’t mind helping people out with a glut of apples. We picked some apples and now have two very large carrier bags full. Later my daughter and I walked along a quiet country lane and picked a few tubs of rosehips. Then there were the quince. My three very beautiful quince from the last post plus a couple of pounds of quince my mum had given to me. Usually she picks her own, makes a few jars of something lovely, then gifts them around the family. This year however she wasn’t quite well enough to pick and cook them so I picked them and will pass around some of my jars. We can all still share in the goodness. And the preserving marathon begins. Usually I only make a few jars of jelly because it really irks me to throw out the useable fruit. This year I put the apple and quince through a sieve to use the pulp in my jams but the rosehips can’t be reused because of the tiny hairs, so I squeezed them out as best as I could before straining. There are al lot more jars than this I couldn’t fit all of them in front the lens. I plan to bottle some apple sauce once I’ve looked up how to do it. Bottling things is not something we’ve tried before but I would really like to give it a go. Just the thought of having homemade apple sauce through the winter is more than enough incentive. Today I was making stew. Nothing out of the ordinary really. I was chopping up some butternut squash to and about to throw the seeds away when I thought what a shame, isn’t there something I can do with them. 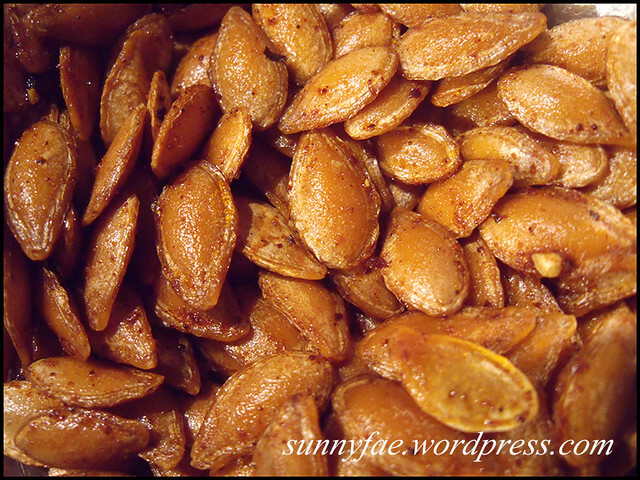 I knew pumpkin seeds could be roasted so hey why not these? I scooped the seeds out and rinsed them in cold water and dried them off, then put them in a small tray with some olive oil, spices and roasted them in a moderate oven for about half an hour. All amounts are to taste since I rarely measure anything. Just a small sprinkling of everything. There are loads of recipes out in the internet for roasting seeds I just used what ever I had in my cupboard. They’re crunchy and tasty and I’m definitely going to try this again. Apparently they’re also very good for you. Even better! Bye for now. Have fun!